Today I finally bit the bullet and bought a new camera bag. 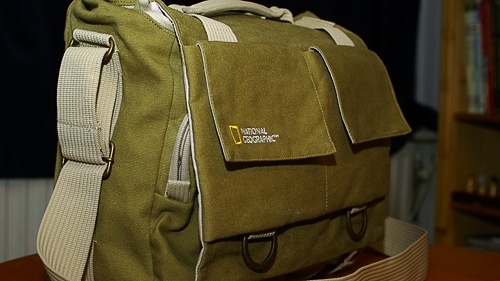 The low-down on my new National Geographic Earth Explorer shoulder bag. I've been searching for The Perfect Bag for a long time, but never found it. An article about the new National Geographic Earth Explorer series finally caught my attention a few months ago. These bags seemed to be what I was looking for: roomy yet compact, with lots of small pockets for stuff like notebooks, a4-sized paper, mp3 player and all the other gubbins a commuting geek needs. A bag suitable for light travel, as well as the possibility to pack a lot of gear inside if the need arises. But at the time, it seemed like it would be a one-off, limited edition product line, which surely wouldn't be coming to Europe. Until I discovered the bag in real life at Photokina 2006. After that, it continued to pop up on all kinds of websites, and last night, after reading some good reviews of it, I decided to check out the camera store on-line shop. And behold! They had the whole line in store. The nearest competitor, and my initial first choice was the Lowepro Stealth Reporter D400AW. A very rugged camera bag, also not too large. But it's solely a camera bag, there is not much room left for other stuff. It also is a lot bigger then the National Geographic medium shoulder bag, as I discovered in the shop. The bag was quite able to cope with my camera, and leaves plenty of room for the little bits you take whilst travelling. It's slim profile means it's easier to manoeuvre in crowded places then a normal camera bag. Extra cool-points are awarded for the environmentally-friendliness of the bag: it's fashioned out of cotton, hemp, and uses brass buckles. I'm very happy with this latest addition to the arsenal, and hope I'll be able to put it to the test real soon!